1 of 3 Heat oven to 450 degrees . Place pork on a small foil-lined rimmed baking sheet and spoon 3 tbsp barbecue sauce on top. Bake 15 minutes. 2 of 3 In a medium bowl, toss apple, celery and carrots. In a small bowl, whisk mayo and next 4 ingredients. Add to apple mixture and toss to combine. 3 of 3 Spoon remaining barbecue sauce over pork and bake 5 to 10 more minutes, until temperature reaches 145 degrees . 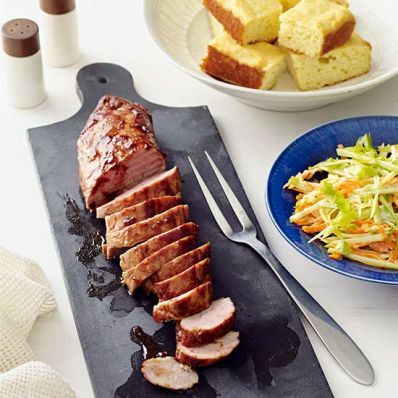 Slice pork and serve with apple slaw and cornbread or rolls. 1 of 1 Combine 1 box (8 1/2 oz) cornbread mix, 1/3 cup milk and 1 large egg in a bowl. If desired, stir in 3 slices chopped cooked bacon. Spread into an 8-inch square pan and bake at 400 degrees for 15 to 20 minutes.